I took some of your many great suggestions and made a few more blocks. Citricsugar's idea of a crane really struck me, so here's my attempt. And I really want to see the blocks you have made Linzi! Thanks for all the ideas and encouragement! 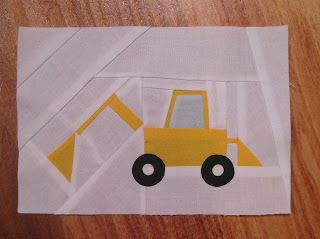 I got three more done tonight, although I'm not sure this really looks like a road roller. 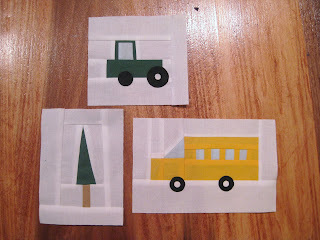 So I've been chugging right along with these tiny vehicles, houses, treees, etc. thinking I was making great progress on my son's quilt. I then made the mistake of estimating how many blocks I'll need for a twin sized quilt: 35. That means I still have 16 to make, and that's if I include all the ones I've made so far. I was hoping to have the luxury of relegating a few odd balls to the back of the quilt. Sigh. More construction vehicle inspiration may be needed. So I tackled the backhoe digger (bet no one else has used that title) that has been intimidating me. It's not exactly what I was going for, but I think it's as good as I am going to get. The little red house is my favorite house so far. 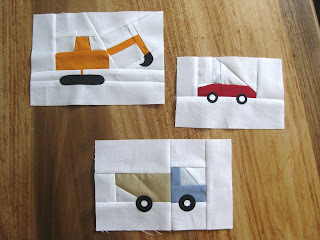 More pieces for my tiny construction vehicles, etc. quilt. 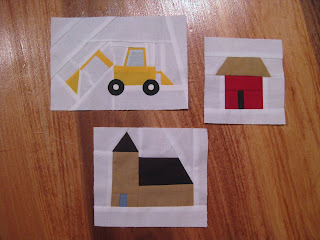 Next up, some more intricate houses, and I think I need a church, like in the inspiration quilt. I'm saving the most challenging vehicle for last: backhoe digger! I have no idea how I'm going to pull that off in this small scale. Well after three different attempts at borders, I finished piecing the top of my commissioned quilt. These colors were a challenge to work with, but I'm pleased with the results. 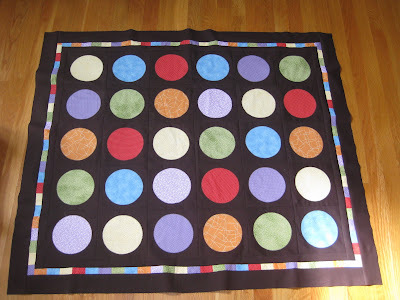 I used the circle quilt tutorial here, but did use a fusible web for the outer edges of the circle to prevent fraying (which adds a lot of work cutting each circle by hand, rather than with a rotary cutter), and I chose to use a blanket stitch. 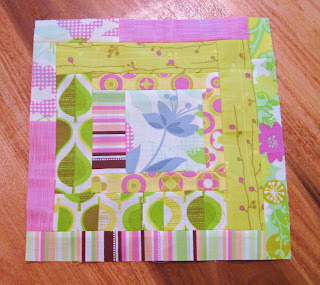 I tried the striped border on my quilt that you see in the tutorial, but with these fabrics, it was just too loud :). I opted for a thin strip of stripes instead. Now I've got to decide how to quilt it! 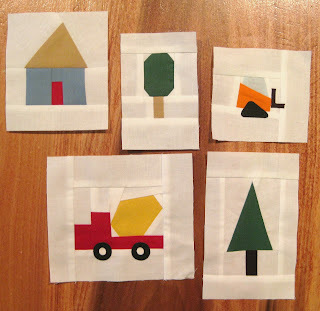 Linzi asked for improvisational log cabin blocks. This was a lot more work than I thought it would be! 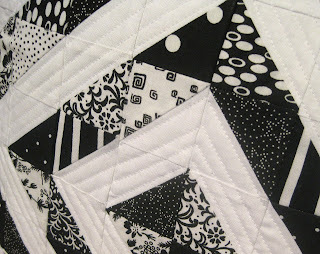 It's a fun style of piecing, but it is a lot of work: cutting, piecing, ironing for each piece. The block is 12.5 inches square. 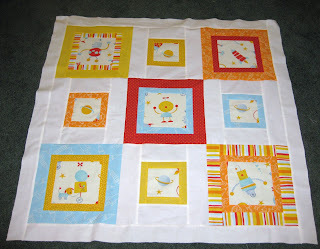 The second block has no sashing because I ran out, but Linzi will add it on her end. I've tried making a dump truck three times now with no luck. Can't seem to get the angles right, so I've stuck to these simple shapes. I wonder if I'll need to draft paper foundations for the more complex construction vehicle shapes. Has anyone tried making paper foundations? There is the most fabulous and unique quilt over on flickr. It has inspired many people to make similar, tiny house blocks. I'm going to do that too, but I thought it would be fun to add vehicles to the mix. 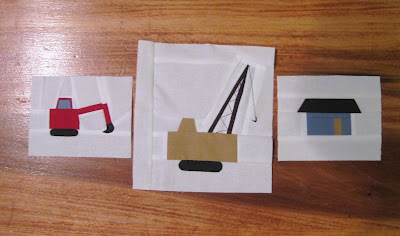 Construction vehicles mostly, since that is the obsession of my eldest. 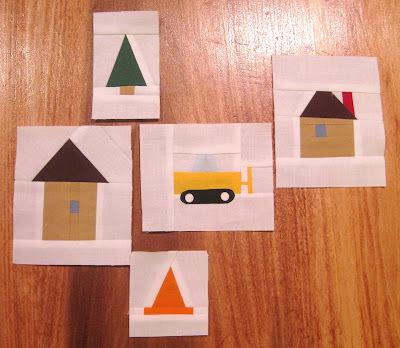 How cute would a quilt with tiny vehicles, house, tress, construction cones, etc. be, I thought? 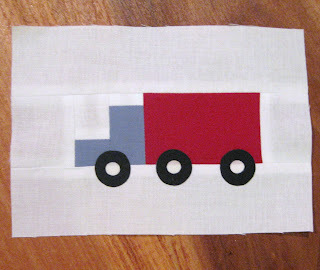 Here's my first attempt at improvisional piecing of a big rig. It is four inches long, mind you, and it may not make the cut, being so large. I think the cuteness lies in the tiny scale of the objects. 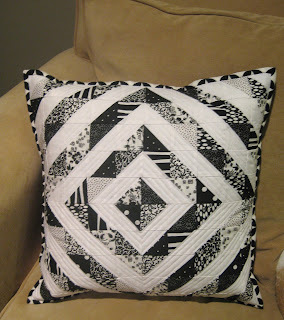 My 4am flash of inspiration - fussy cut the tires out of black and white polka dot fabric! That makes the white centers of the tires. Brillant. I fused the wheels, but I'll stitch them down as well. 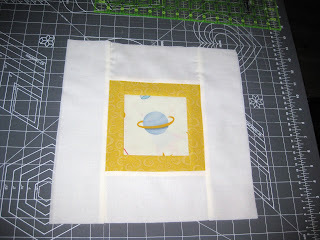 I'll surround this block with white to make the total block 12.5 inches square. More cuteness to follow I'm sure. Oh, and I'm almost done piecing the top of my commission quilt. Photos soon. I love how the quilting turned out. 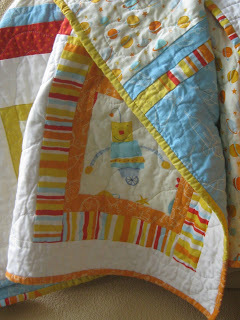 This adorable boy's quilt is a great way to use any fabric with large, feature motifs. You could easily adapt it to be for a girl by changing the fabric. Use more squares to make it twin size. 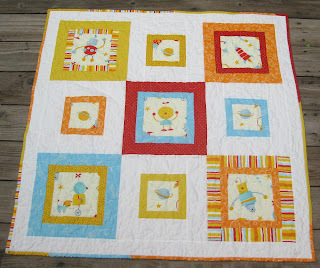 I think five squares by seven squares would be perfect and really make the big square, small square pattern pop more than it does in this simple nine square arrangement. And with that aside, let's begin! 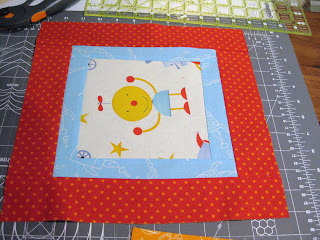 For the larger squares, I fussy cut around robots in a 6 1/2 inch square. 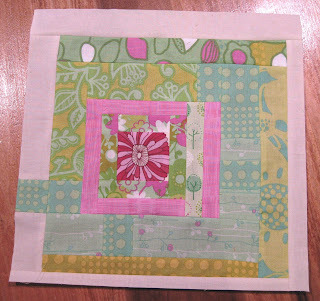 For the smaller moon squares I used a 4 1/2 inch square. 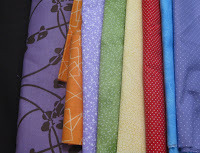 From your coordinating colored prints cut some strips 2 1/4 inches and the rest 1 1/2 inches wide. Cut long strips of white fabric 3 1/4 inches wide. 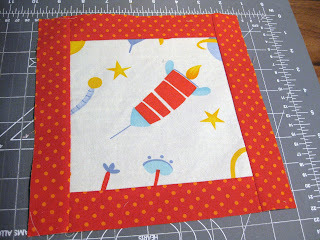 Sew the 1 1/2 inch strips onto the top and bottom of the robot squares. I cut pieces by just eyeballing the strips a little larger than needed, sewed them on, pressed the seems to one side, then trimmed them to the correct length. This gives you the exact length you need and keeps the block nice and square. Next sew two more 1 1/2 inch strips to the two sides of the block. Press and trim. 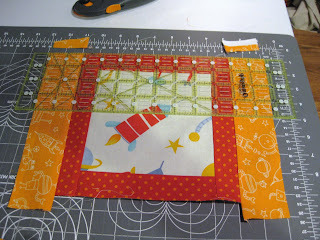 In the same way, sew the 2 1/4 inch strips around the thinner strips which are now around the robot squares. 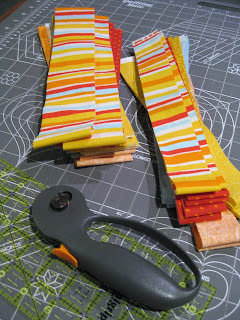 In the same way, sew the 2 1/4 inch strips around the thinner strips which are now around the robot squares. 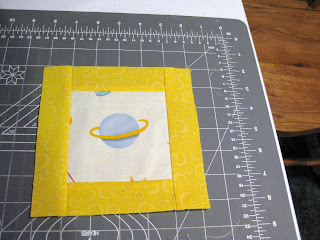 To make the smaller, moon squares, sew the 1 1/2 inch strips around the moon square. Then sew the 3 1/4 inch white strips around that. All your squares should be about 11 inches square when they are finished. 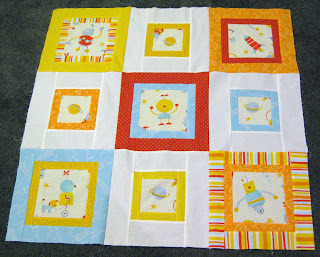 When you have completed five robot blocks and four moon blocks you are ready to put together the quilt top. 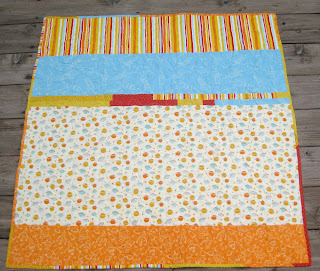 Sew the blocks together according to the layout in the photo. 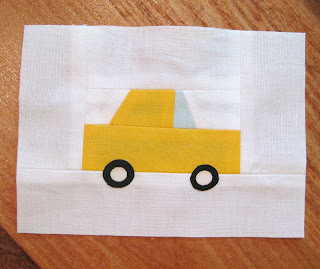 I sewed a 2 1/2 white border on all four sides. Then layer and baste with batting and backing. 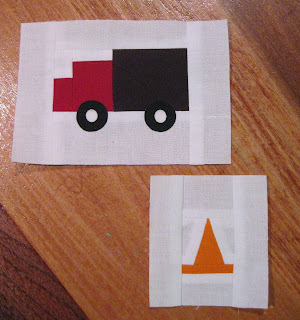 I pieced my backing with leftover fabric, but you can use whatever you like. I machine quilted my quilt in a large meandering design (which I don't think I'll try again anytime soon. I'm just not good at freemotion!). I made a pieced binding from leftover fabrics which I think is a really cute look. 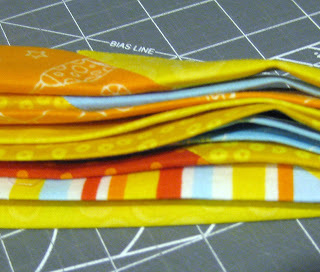 My binding was double fold style and 2 1/4 inches wide. The finished quilt is about 35 inches square. I used 3/4 yard of the robot print because of all the fussy cutting and 1/4 to 1/3 yard of 6 different coordinating prints. Please let me know if you have any questions, and I'll revise the tutoral accordingly! I'm excited to say I am beginning my first commissioned quilt! 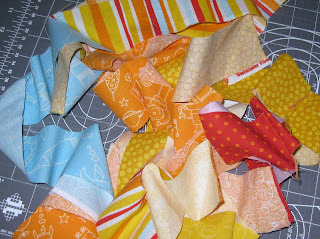 Here are the fabrics I pulled to go with the dust ruffle in the baby's nursery. I think I'll use the lavender and brown print as the backing. My client is giving me a lot of freedom in terms of designs, so right now I'm thinking I might do a circle quilt like this but with a brown background. Do you think that is too much like the dust ruffle? If I wanted to contrast the ruffle pattern I thought of doing simple horizontal stripes with a monogram on the right bottom corner. 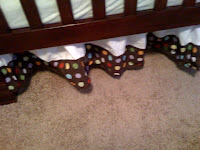 I like that idea, and so does my client, however I'm not loving the fabrics right next to eachother. I think I like them better separated by brown. Ideas? 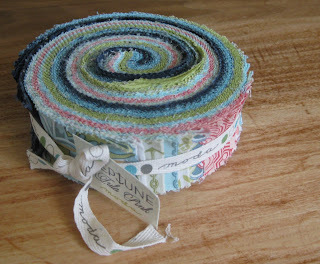 While fabric shopping I couldn't resist this Neptune honey bun. Cute! Maybe I'll do a railfence or log cabin with it.